Born to privilege, called to service, trained for command, seventeen-year-old Lieutenant Nile Greysik finally gets the chance to prove herself a leader. As she takes charge of a captured enemy ship, her orders will take her through hostile waters and stormy seas with a hold full of prisoners, a skeptical crew, and a handsome first mate whose every move undermines her confidence. To navigate to safe harbor, Nile must earn the crew’s trust . . . but first she must dare to trust herself. 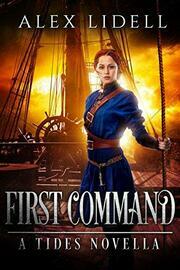 FIRST COMMAND is a prequel novella in Alex Lidell’s TIDES series. Recommended for fans of Sarah J. Maas, Tamora Pierce, and Naomi Novik.